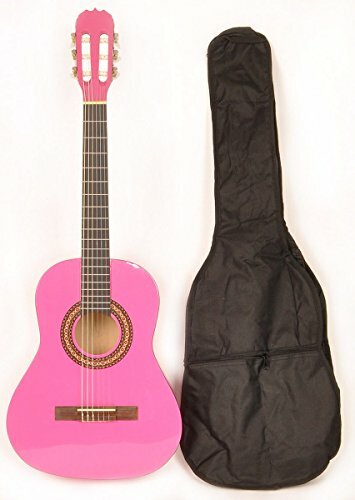 This guitar features: beautiful Spanish guitar styling (usually only found on guitars double this price); classical guitar string set-up with steel for the bottom 3 strings and nylon for the top 3; classical style open tuners; Natowood fretboard and bridge; elegant basswood back and sides; ornate sound hole binding; and free carry bag! Overall length: 36 1/2". Width of the neck at the nut: 1 3/4". Scale length: 23". Q: Can I add a strap ? A: Yes you can - the Performance Plus Classical Guitar Strap GS1200 can be found on Amazon for about $9.95.